Current Infiniti Offers @ Markham Infiniti Dealer ON. Disclaimer: Financing offer available on new 2019 QX50 (E6LG79 AA00) model only. Selling price is $46,162 financed at 2.99% APR and 3.99% effective APR, equals $701 monthly payments for 60 months including a $5 150 down payment and $500 finance cash. Cost of borrowing is $3,193 for a total obligation of $49,354. Freight and PDE charge of $2,045 and all applicable levies and charges are included. Other taxes (where applicable), license, registration, insurance, duties and applicable taxes are extra. Offers are available on approved credit through Infiniti Financial Services until midnight on May 1st, 2019. Offer may change without notice and cannot be combined with any other offers. All prices are subject to change without notice. Retailer may sell for less. Retailer order/trade may be necessary. Certain conditions may apply. Vehicle and wheels may not be exactly as shown. See your nearest Infiniti retailer for complete details. Valid on in-stock units only. While supplies last. Offers valid on eligible vehicles purchased, registered as sold and delivered by midnight on May 1st, 2019. Offers may change without notice. Certain conditions may apply. Retailer may lease for less. Retailer order/trade may be necessary. See your nearest INFINITI retailer for complete details. 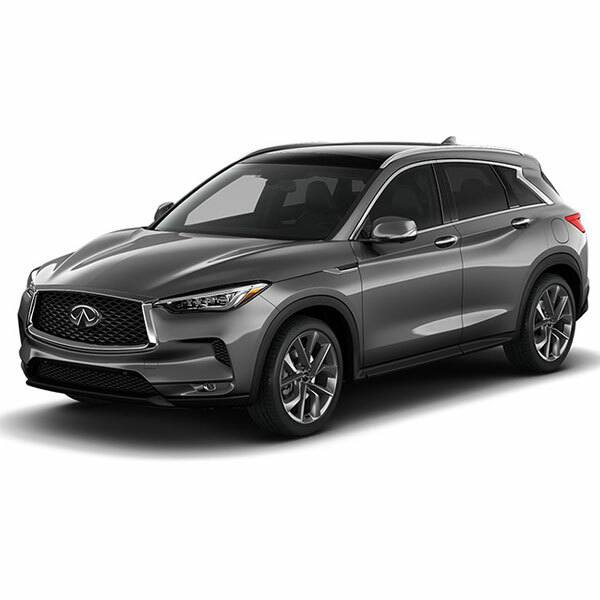 *During the Offer Period, receive $2,000 in Cash Incentive when you purchase a new 2019 QX50 (E6LG79 AA00) models only (deducted from the negotiated selling price of the vehicle before taxes). The $2,000 is a non-stackable cash and is not combinable with subvented lease or finance programs. Valid on in-stock units only. While supplies last. Offers valid on eligible vehicles purchased, registered as sold and delivered by midnight on May 1st, 2019. Offers are available for a limited time, may change without notice and cannot be combined with any other offers. Certain conditions may apply. Vehicle and wheels may not be exactly as shown. See your nearest Infiniti retailer or infiniti.ca for complete details. Lease offer of $502 monthly payment at 2.99% lease APR and 3.43% effective APR for a 48-month term with $5,150 down payment, $1,000 lease cash and $0 security deposit available on 2019 QX50 (E6LG79 AA00) models only. Payment includes $25 Tire Tax, Freight and PDE charges of $2,045, and all applicable levies and charges. License, registration, insurance, duties and applicable taxes are extra. First monthly payment due at lease inception. Total lease obligation is $29,260. Based on a maximum of 16,000km per year with excess charged at $0.15/km. Offer may not be redeemed for cash and may not be combined with certain offers. Conditions and limitations apply. Ask your retailer for details. Offer available on approved credit through INFINITI Financial Services until midnight on April 1st, 2019. Offers may change without notice. Certain conditions may apply. Retailer may lease for less. Retailer order/trade may be necessary. See your nearest INFINITI retailer for complete details. While supplies last. Offers valid on eligible vehicles purchased, registered as sold and delivered by midnight on May 1st, 2019. Offers may change without notice. Certain conditions may apply. Retailer may lease for less. Retailer order/trade may be necessary. See your nearest INFINITI retailer for complete details. LEASE: From $455 @ 1.99% for 48 months with $3,750 down payment CASH: Up to $4,000 Spring Cash available! FINANCE: From 2.99% for 60 months. Disclaimer: Lease offer of $455 monthly payment at 1.99% lease APR and 3.98% effective APR for a 48-month term with $3,750 down payment, $1,500 Lease Cash and $0 security deposit available on 2019 Q50 (Q4SG79 AA00) models only. Payment includes $86 PPSA, Freight and PDE charges of $2,045, and all applicable levies and charges. License, registration, insurance, duties and applicable taxes are extra. First monthly payment due at lease inception. Total lease obligation is $25,580. Lease is based on a maximum of 16,000km per year with excess charged at $0.15/km. Conditions and limitations apply. Ask your retailer for details. Offer available on approved credit through INFINITI Financial Services until midnight on May 1st, 2019. Offers may change without notice. Certain conditions may apply. Retailer may sell for less. Retailer order/trade may be necessary. See your nearest INFINITI retailer for complete details. Offers may change without notice. Certain conditions may apply. Retailer may lease for less. Retailer order/trade may be necessary. See your nearest INFINITI retailer for complete details. 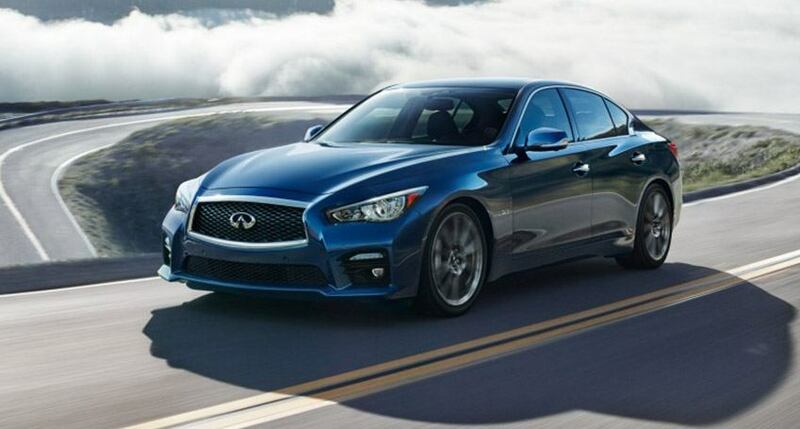 *During the Offer Period, receive $4,000 in Cash Incentive when you purchase a new 2019 Q50 (Q4SG70 AA00) models only (deducted from the negotiated selling price of the vehicle before taxes). The $4,000 is a non-stackable cash and is not combinable with subvented lease or finance programs. Valid on in-stock units only. While supplies last. Offers valid on eligible vehicles purchased, registered as sold and delivered by midnight on May 1st, 2019. Offers are available for a limited time, may change without notice and cannot be combined with any other offers. Certain conditions may apply. Vehicle and wheels may not be exactly as shown. See your nearest Infiniti retailer or infiniti.ca for complete details. Financing offer available on new 2019 Q50 (Q4SG79 AA00) model only. Selling price is $46,667 financed at 2.99% APR and 4.94% effective APR, equals $771 monthly payments for 60 months including a $3,750 down payment and $2,000 finance cash. Cost of borrowing is $3,341 for a total obligation of $50,008. Freight and PDE charge of $2,045 and all applicable levies and charges are included. Other taxes (where applicable), license, registration, insurance, duties and applicable taxes are extra. Offers are available on approved credit through Infiniti Financial Services until midnight on May 1st, 2019. Offer may change without notice and cannot be combined with any other offers. All prices are subject to change without notice. Retailer may sell for less. Retailer order/trade may be necessary. Certain conditions may apply. Vehicle and wheels may not be exactly as shown. See your nearest Infiniti retailer for complete details. Offers valid on eligible vehicles purchased, registered as sold and delivered by midnight on May 1st, 2019. Offers may change without notice. Certain conditions may apply. Retailer may lease for less. Retailer order/trade may be necessary. See your nearest INFINITI retailer for complete details. Disclaimer: Financing offer available on new 2019 QX60 (J6XG19 AA00) model only. Selling price is $48,867 financed at 2.99% APR and 5.87% effective APR, equals $794 monthly payments for 60 months including a $4,650 down payment and $2,000 finance cash. Cost of borrowing is $3,442 for a total obligation of $52,309. Freight and PDE charge of $2,045 and all applicable levies and charges are included. Other taxes (where applicable), license, registration, insurance, duties and applicable taxes are extra. Offers are available on approved credit through Infiniti Financial Services until midnight on May 1st, 2019. Offer may change without notice and cannot be combined with any other offers. All prices are subject to change without notice. Retailer may sell for less. Retailer order/trade may be necessary. Certain conditions may apply. Vehicle and wheels may not be exactly as shown. See your nearest Infiniti retailer for complete details. Valid on in-stock units only. While supplies last. Offers valid on eligible vehicles purchased, registered as sold and delivered by midnight on May 1st, 2019. Offers may change without notice. Certain conditions may apply. Retailer may lease for less. Retailer order/trade may be necessary. See your nearest INFINITI retailer for complete details. 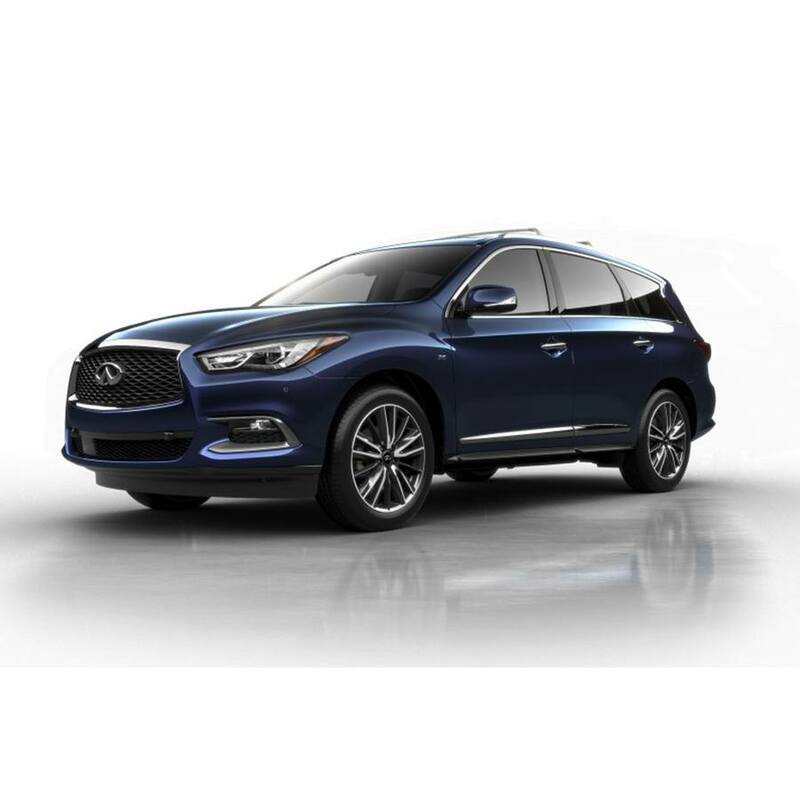 Lease offer of $488 monthly payment at 1.99% lease APR and 6.98% effective APR for a 27-month term with $5,440 down payment, $1,000 lease cash and $0 security deposit available on 2019 QX60 (J6XG19 AA00) models only. Payment includes $100 AC tax, $10 OMVIC fee, $17 tire tax, Freight and PDE charges of $2,045, and all applicable levies and charges. License, registration, insurance, duties and applicable taxes are extra. First monthly payment due at lease inception. Total lease obligation is $18,608. Lease is based on a maximum of 16,000km per year with excess charged at $0.15/km. Offer may not be redeemed for cash and may not be combined with certain offers. Conditions and limitations apply. Ask your retailer for details. Offer available on approved credit through INFINITI Financial Services until midnight on May 1st, 2019. Certain conditions may apply. Retailer may lease for less. Retailer order/trade may be necessary. See your nearest INFINITI retailer for complete details. Valid on in-stock units only. While supplies last. Offers valid on eligible vehicles purchased, registered as sold and delivered by midnight on May 1st, 2019. Offers may change without notice. Certain conditions may apply. Retailer may lease for less. Retailer order/trade may be necessary. See your nearest INFINITI retailer for complete details. LEASE: Lease from $845/monthly for 48 months at 2.99% with $5,408 Down Payment. CASH: GET UP TO $5,000 Spring Cash credits* FINANCE: FInance from 3.99% up to 60 months! Disclaimer: Financing offer available on new 2019 QX80 (9CRG79 AA00) model only. Selling price is $77,522 financed at 3.99% APR and 4.57% effective APR, equals $1,298 monthly payments for 60 months including a $7,050 down payment and $4,000 finance cash. Cost of borrowing is $7,380 for a total obligation of $84,901. Freight and PDE charge of $2,045 and all applicable levies and charges are included. Other taxes (where applicable), license, registration, insurance, duties and applicable taxes are extra. Offers are available on approved credit through Infiniti Financial Services until midnight on May 1st, 2019. Offer may change without notice and cannot be combined with any other offers. All prices are subject to change without notice. Retailer may sell for less. Retailer order/trade may be necessary. Certain conditions may apply. Vehicle and wheels may not be exactly as shown. See your nearest Infiniti retailer for complete details. . Valid on in-stock units only. While supplies last.Offers valid on eligible vehicles purchased, registered as sold and delivered by midnight on May 1st, 2019. Offers may change without notice. Certain conditions may apply. Retailer may lease for less. Retailer order/trade may be necessary. See your nearest INFINITI retailer for complete details. *During the Offer Period, receive $5,000 in Cash Incentive when you purchase a new 2019 QX80 (9CRG79 AA00) models only (deducted from the negotiated selling price of the vehicle before taxes). The $5,000 is a Standard Rate Finance Cash incentive. Valid on in-stock units only. While supplies last. Offers valid on eligible vehicles purchased, registered as sold and delivered by midnight on May 1st, 2019. Offers are available for a limited time, may change without notice and cannot be combined with any other offers. Certain conditions may apply. Vehicle and wheels may not be exactly as shown. See your nearest Infiniti retailer or infiniti.ca for complete details. 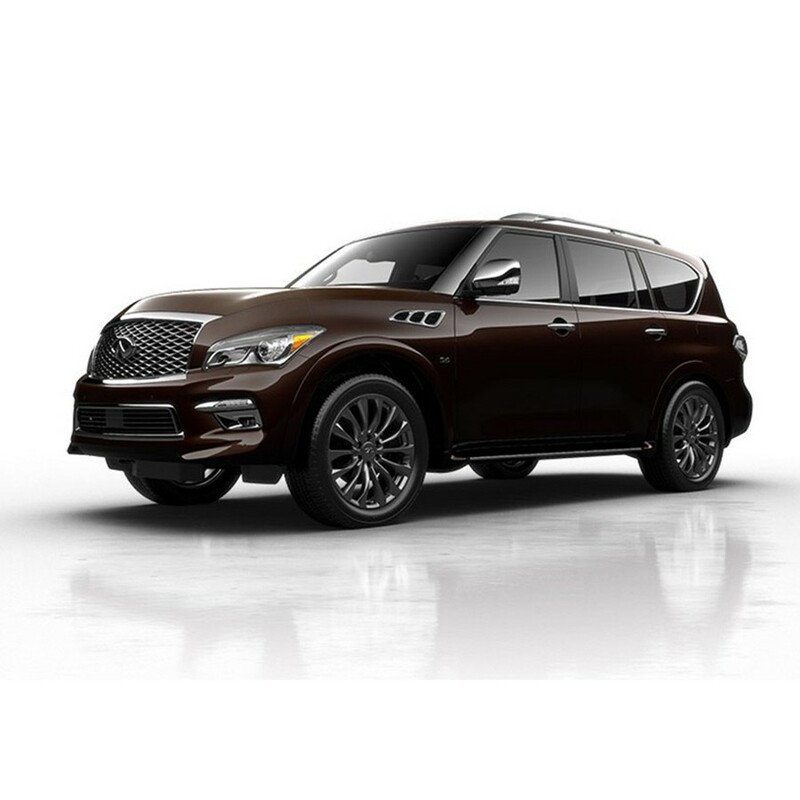 Lease offer of $845 monthly payment at 2.99% lease APR and 3.33% effective APR for a 48-month term with $5,408 down payment, $4,300 lease cash and $0 security deposit available on 2019 QX80 (9CRG79 AA00) models only. Payment includes $86 PPSA, Freight and PDE charges of $2,045, and all applicable levies and charges. License, registration, insurance, duties and applicable taxes are extra. First monthly payment due at lease inception. Total lease obligation is $45,972. Lease is based on a maximum of 16,000km per year with excess charged at $0.15/km. Offer may not be redeemed for cash and may not be combined with certain offers. Conditions and limitations apply. Ask your retailer for details. Offer available on approved credit through INFINITI Financial Services until midnight on April 1st, 2019. Offers may change without notice. Certain conditions may apply. Retailer may sell for less. Retailer order/trade may be necessary. See your nearest INFINITI retailer for complete details. Valid on in-stock units only. While supplies last. Offers valid on eligible vehicles purchased, registered as sold and delivered by midnight on May 1st, 2019. Send me exclusive offers and promotions. View DisclaimerBy submitting your email address or phone number, you allow us, Markham Infiniti, to include you on our contact lists to send you information about our products, services and promotions. You may revoke consent at any time by clicking on the "Unsubscribe" link in your email.